The latest development in textiles and fibres is a kind of soft hardware that you can wear: cloth that has electronic devices built right into it. Researchers at MIT have now embedded high speed optoelectronic semiconductor devices, including light-emitting diodes (LEDs) and diode photodetectors, within fibres that were then woven at Inman Mills, in South Carolina, into soft, washable fabrics and made into communication systems. This marks the achievement of a long-sought goal of creating smart fabrics by incorporating semiconductor devices — the key ingredient of modern electronics — which until now was the missing piece for making fabrics with sophisticated functionality. This discovery, the researchers say, could unleash a new 'Moore’s Law' for fibres — in other words, a rapid progression in which the capabilities of fibres would grow rapidly and exponentially over time, just as the capabilities of microchips have grown over decades. The findings are described in the journal Nature in a paper by former MIT graduate student Michael Rein; his research advisor Yoel Fink, MIT professor of materials science and electrical engineering and CEO of AFFOA (Advanced Functional Fabrics of America); along with a team from MIT, AFFOA, Inman Mills, EPFL in Lausanne, Switzerland, and Lincoln Laboratory. Optical fibres have been traditionally produced by making a cylindrical object called a 'preform,' which is essentially a scaled-up model of the fibre, then heating it. Softened material is then drawn or pulled downward under tension and the resulting fibre is collected on a spool. 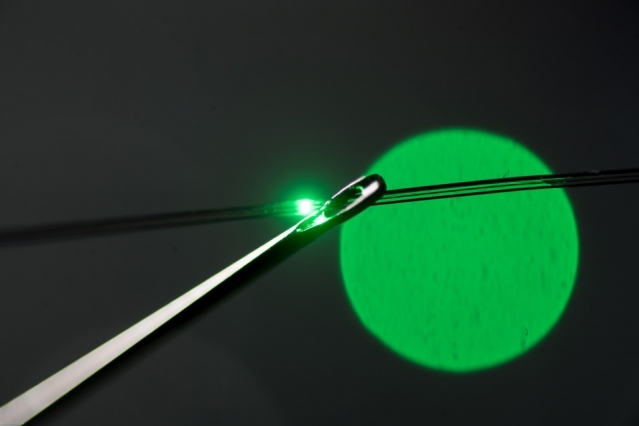 The key breakthrough for producing these new fibres was to add to the preform light-emitting semiconductor diodes the size of a grain of sand, and a pair of copper wires a fraction of a hair’s width. When heated in a furnace during the fibre-drawing process, the polymer preform partially liquified, forming a long fibre with the diodes lined up along its center and connected by the copper wires. In this case, the solid components were two types of electrical diodes made using standard microchip technology: light-emitting diodes (LEDs) and photosensing diodes. “Both the devices and the wires maintain their dimensions while everything shrinks around them” in the drawing process, Rein said. The resulting fibres were then woven into fabrics, which were laundered 10 times to demonstrate their practicality as possible material for clothing. One of the advantages of incorporating function into the fibre material itself is that the resulting fibre is inherently waterproof. To demonstrate this, the team placed some of the photodetecting fibres inside a fish tank. A lamp outside the aquarium transmitted music (appropriately, Handel’s 'Water Music') through the water to the fibres in the form of rapid optical signals. The fibres in the tank converted the light pulses — so rapid that the light appears steady to the naked eye — to electrical signals, which were then converted into music. The fibres survived in the water for weeks. Though the principle sounds simple, making it work consistently, and making sure that the fibres could be manufactured reliably and in quantity, has been a long and difficult process. Staff at the Advanced Functional Fabric of America Institute, led by Jason Cox and Chia-Chun Chung, developed the pathways to increasing yield, throughput, and overall reliability, making these fibres ready for transitioning to industry. At the same time, Marty Ellis from Inman Mills developed techniques for weaving these fibres into fabrics using a conventional industrial manufacturing-scale loom. “This paper describes a scalable path for incorporating semiconductor devices into fibres. We are anticipating the emergence of a ‘Moore’s law’ analog in fibres in the years ahead,” Fink said. He said that the first commercial products incorporating this technology will be reaching the marketplace as early as next year — an extraordinarily short progression from laboratory research to commercialisation. Such rapid lab-to-market development was a key part of the reason for creating an academic-industry-government collaborative such as AFFOA in the first place, he said. These initial applications will be specialised products involving communications and safety. “It's going to be the first fabric communication system. We are right now in the process of transitioning the technology to domestic manufacturers and industry at an unprecendented speed and scale,” he said. Beyond communications, the fibres could potentially have significant applications in the biomedical field, the researchers say. For example, devices using such fibres might be used to make a wristband that could measure pulse or blood oxygen levels, or be woven into a bandage to continuously monitor the healing process.